In 2005, HLW first stepped into Jersey City with two well-renowned developers in Ironstate Development and Kushner Real Estate Group. 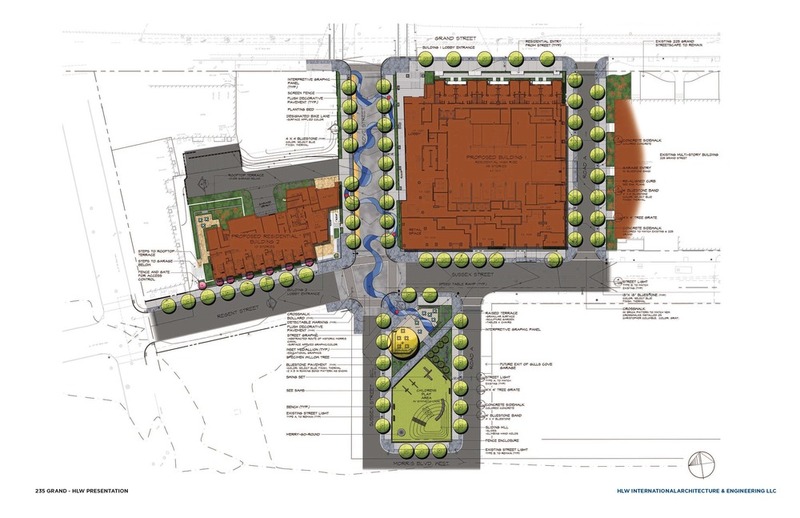 The focus was an underdeveloped 80 acre brownfield site behind the new urbanism principles of a redevelopment plan for a pedestrian and transit oriented neighborhood. The plan targeted a variety of mixed-use developments organized around an open network of small city blocks; emulating the likes of NYC's West Village. The neighborhood was Liberty Harbor North. With only a handful of developments already in place, HLW was retained to design a mid-rise 15-story multi-family luxury rental building on the corner of Grand Street and Marin Boulevard. The site, formally known as 'Block 7' per the redevelopment plan, came to be the home of 225 Grand with 348 residential units with retail, an internal parking garage, and rooftop amenities. The building was built in roughly two years and fully rented in six months. That success led to the developers' interest to shift their focus with HLW on the adjacent block to the west; the former home of the Jersey City Boys and Girls Club. With the Jersey City Boys and Girls Club relocating in the local vicinity, the developers and HLW began collaborating with the Jersey City Planning Department on restructuring the site to better compliment the urban fabric of the surrounding area; including but not limited to Liberty Harbor North. HLW's collaboration efforts to recognize the need to divide what was a "superblock" to propose a new street dividing the parcel into two areas of development were well received and successfully evolved into two building projects. The site, formerly known as 'Block 5', became 5.1 and 5.2 with the new subdivision and became HLW's next focus. The east parcel called for a 45-story luxury rental residential tower with 540 units, an internal parking garage, retail, and amenities while the east parcel was designed towards a 10-story 131 unit rental building. The reorganization of the block also improved the street network to the south connecting two existing streets with a consideration of extending a lot dedicated to green space. The developers even went further into introducing an amenity program into the park that included a children's playground and a seating area designed around a newly planted oak tree with additional green space. The proposed street that divided the parcel also became an extension of Grove Street to the north which is a major thoroughfare to other existing townhomes, retail, and Jersey City Town Hall. 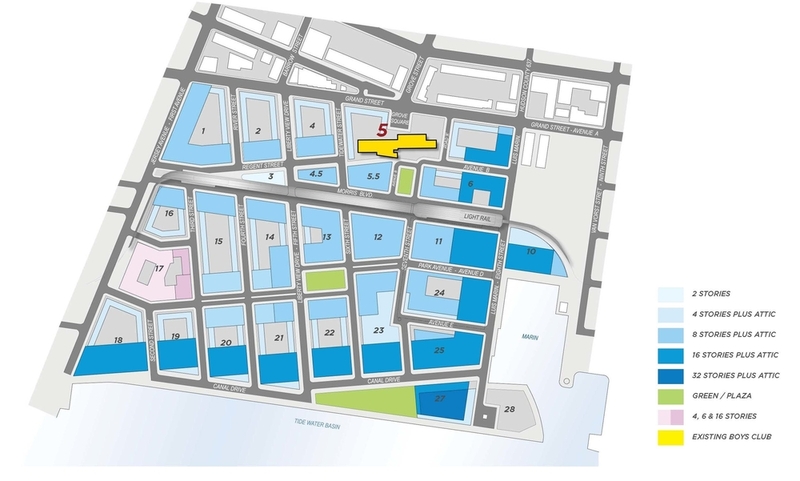 The proposed street, between Blocks 5.1 and 5.2, was also designed to become a place for future community street fairs. Decorative treatment that contained graphics to symbolize the former location of the Morris Canal and the history of the area also called for the street to be at the same level as the sidewalk with no curbs and installation of bollards along the walk. The project which eventually came to be 235 Grand, pictured below, is planned to start construction later in 2016. HLW Director of Architectural Design, Ed Shim, recently spoke on this subject at the 2016 New Jersey Planning Conference. In the Harborside Financial District, HLW is the executive architect to the rising URL Harborside (69-story 763 unit hi-rise) working with Ironstate Development and Mack-Cali Realty Corp. Ironstate Development has also retained HLW to develop 90 Columbus (50-story 540 unit hi-rise). Toll Brothers City Living has retained HLW to focus on a site in the Powerhouse Arts District for the second phase of Provost Square (28-story 237 unit hi-rise). The LeFrak Organization is currently working with HLW on the Ellipse Tower in Newport (41-story 376 unit hi-rise), Revetment House in the Jersey Ave Tenth Street District (6-story 163 unit lo-rise), and is continuing talks for a new site in Newport as well. Jersey City expects all the recent new developments in the area to contribute to an unprecedented increase of 8,000 in the city's population.